A full colour map of the Llangollen and Montgomery Canals suitable for both waterways and leisure users. This map gives detailed coverage of the Llangollen and Montgomery Canals with emphasis on the waterways and information useful and relevant to users of the waterways without neglecting other leisure users. The map detail is complimented by information panels and photographs. The Llangollen Canal is one of the most picturesque canals with its stunning scenery varying from green pastures to tree lined lakes. It meanders it way through the medieval town of Whitchurch, the lovely market town of Ellesmere and situated at the end of the canal is the pretty town of Llangollen, world renowned for its annual International Musical Eisteddfod. Then there is the Pontcysyllte Aqueduct, surely one of, if not the most inspiring architectural and engineering sights anywhere in the country. A World Hertitage Site, it spans the River Dee for 1000 ft at a height of 126 ft. The tranquil Montgomery Canal leaves the Llangollen at Frankton Junction. Closed to boats for many years, it has undergone much restoration, which continues today. Much of the canal has Site of Special Scientific Interest status due to rare aquatic plant life and is bordered by several nature reserves. There's a seven mile navigable section from Frankton Junction and another between Arddleen and Berriew, only accessible by slipway in Welshpool. The canal is also popular with canoeists with some sections accessible only to canoes. A tourist map of the Llangollen and Montgomery Canals at 1:56,000, with detailed town plans of Llangollen, Ellesmere, Whitchurch, Welshpool and Newtown at 1:12,500. Includes navigation and historical information, visitor moorings, marinas and boatyards, boat hire centres, facilities for the boat user, shops and distance markers. Information for the tourist includes tourist information centres, places of interest, pubs, nature reserves, parks, churches, long distance paths, public toilets and caravan and camp sites. 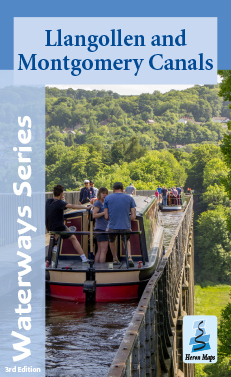 The Llangollen and Montgomery Canals map is available to buy online or by telephone from our business partner, Guidepost. Click on the logo below to visit their store.